Research by Dr. Mark Elbroch, lead scientist for Panthera’s Puma Puma Program, and his colleagues shows that mountain lions benefit ecological communities by increasing local biodiversity and ecosystem health in areas they inhabit. In fact, mountain lions provide a disproportionately large amount of food to their ecological communities compared with other top carnivores. More species of birds and mammals feed on mountain lion kills than they do on any other carrion source recorded around the world, and many birds and mammals dine while the mountain lion is itself still feeding! Mountain lions, by their very presence at a carcass, facilitate access to carrion for smaller carnivores, which would otherwise be blocked by bobcats and coyotes. This buffers competition among other carnivores and increases the potential for co-existence between gray and red foxes and coyotes, among others. Mountain lion kills also sustain foxes during the winter when they lose access to other food sources, as well as migratory birds, including eagles, flying historic migration corridors. 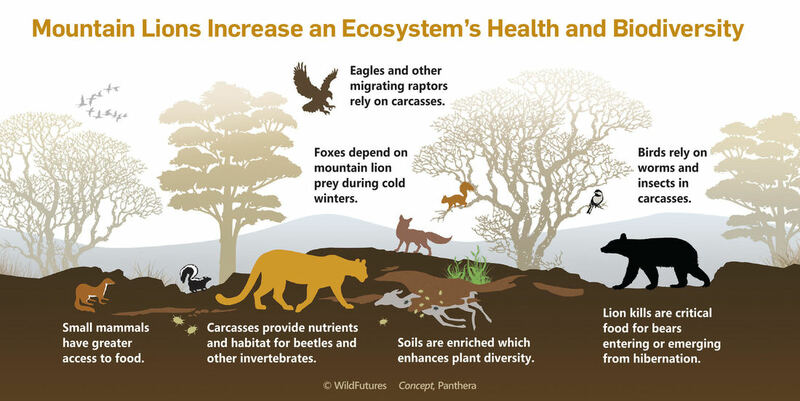 Mountain lion food sharing spreads nutrients through the ecosystem and strengthens entire communities, bolstering ecological health as well as an ecosystem’s ability to recover following unexpected crises, like a disease outbreak or wildfire. Nutrients from carcasses enrich soils and plant communities, creating hotspots that become the places where animals such as elk and deer more frequently forage. Mountain lion prey also become temporary habitats where hundreds of different carrion-dependent invertebrates commune, mate and raise their young. Mountain lion food sharing also bolsters mountain lion communities, facilitating social interactions among these solitary carnivores in ways researchers have yet to puzzle out. What is becoming clear, is that food is a currency among mountain lions, and one that ties these far-wandering animals to each other in amazing ways. Panthera's Teton Cougar Project has been conducting research on cougars in northwest Wyoming since 2000. 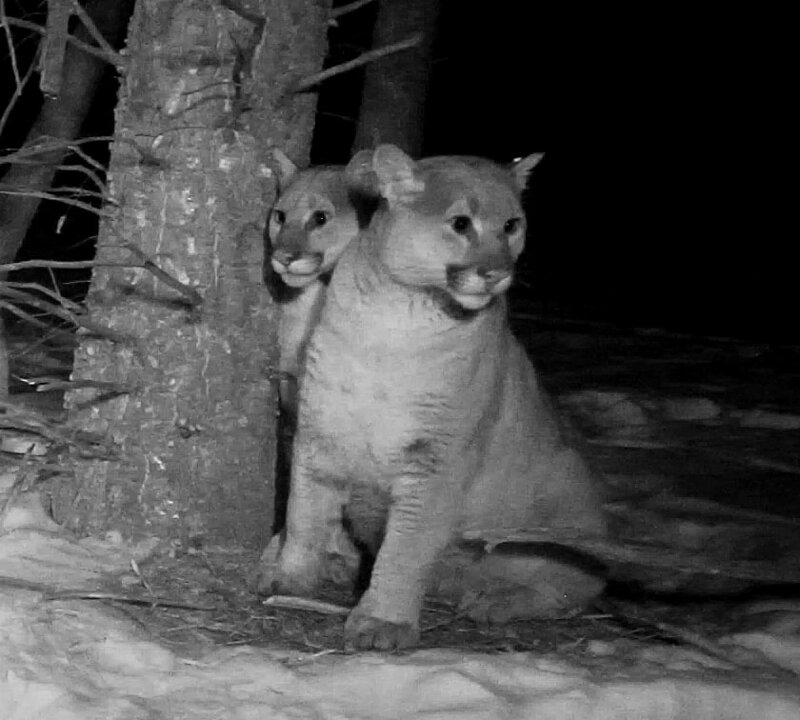 By placing motion-triggered cameras at cougar dens, feeding sites, and other hidden locations, biologists with Panthera's Teton Cougar Project have made fascinating discoveries about the social bonds between cougars and the behaviors passed down from one generation to the next. ​Young kittens learn rapidly from interactions with their mother and siblings, exhibiting behaviors like stalking and caching from an early age. The obvious affection between family members—displayed through vocalizations, physical contact, and other cues—persists until kittens disperse as subadults. Importantly, mothers teach their kittens that social interactions conducted around food differ radically from those occurring at dens or day beds. Family meals are sometimes even shared with other adult cougars. This research has also unveiled the rare and remarkable occurrence of adoption in cougars, where adult females take on orphaned kittens that would otherwise perish. As our understanding of cougar behavior continues to grow, so too can our ability to co-exist with these amazing and complex animals. We should learn to appreciate cougars for the beautiful creatures they are, for the structuring role they play in nature, and we should strive to learn to live with harmoniously with them.